Issued in the blog on April 12, 2019 at 17:04:00. Tomorrow, Saturday April 13th, is the big day - we’re launching the next wave of action on supermarket plastic packaging! 57 local actions with over 330 individuals have registered on the Sick of Plastic online platform, ready to Shop and Drop from this weekend. The action is easy – anyone can take part! Just do your grocery shop as normal but remove the excess plastic from your purchases after payment and place unwanted plastic in the bins provided in-store. We now have 17,000 names on our plastic petition but want to hit 20,000 after this weekend. 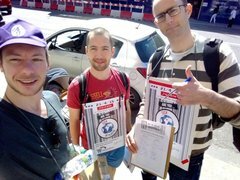 Groups all across the country will be collecting signatures outside supermarkets - and you can help gather signatures too! Issued in news on April 11, 2019 at 16:52:00. Supermarket chain Lidl has unveiled new in-store bins for unwanted packaging just days before the second ‘Shop and Drop’ day of action on supermarket packaging. The Sick of Plastic Campaign, which runs the Shop and Drop initiative, has welcomed Lidl’s engagement but has raised concerns that their new bins conflict with the Government’s advice on what to put in our recycling bins. The three stream recycling station which Lidl are planning to install in supermarkets across Ireland conflicts with My Waste Ireland’s new recycling list, which Minister Bruton advocated for as part of a campaign to reduce contamination in recycling bins. Issued in news on April 04, 2019 at 13:55:00. 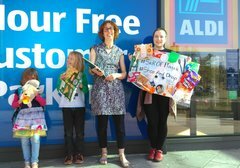 One year on from the nationwide day of action which saw thousands of shoppers leave their unwanted plastic packaging behind in supermarkets, the Sick of Plastic Campaign is launching a new wave of action, kicking off on April 13th. This year Sick of Plastic is encouraging people to mobilise their local communities and organise ongoing shop and drops at their local supermarket. 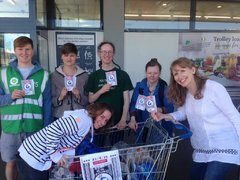 Saturday April 13th is the nationwide kick-off event, marking the beginning of community-led supermarket actions. “Last year’s action really grabbed supermarkets’ attention, but they haven’t made enough lasting changes, and people are frustrated. 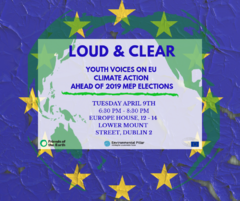 Join us for 'Loud & Clear' - Youth Voices on EU Climate Action ahead of 2019 MEP Elections! Issued in news on April 03, 2019 at 17:54:00. 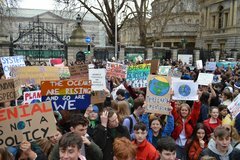 On Tuesday April 9th, a host of young people from a variety of climate action groups will take centre stage in the offices of the European Parliament in Dublin. They'll be talking about what they want to see from prospective candidates for the 2019 European Parliament elections on climate. The elections will take place in Ireland on May 24th. The event is completely free - so get your ticket now! 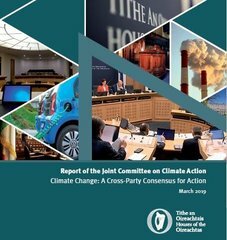 Cross-party negotiations deliver 'Good Friday Agreement' for climate action. Issued in news on March 28, 2019 at 20:45:00. "The Oireachtas has given the Government an historic mandate for serious climate action. "This is the Good Friday Agreement for Irish climate action. It is a cross-party deal to drive policy and measures to cut pollution across all sectors of the economy and society. Issued in the blog on March 22, 2019 at 01:29:00. We have quite a few events coming up, so I thought I’d compile them all into one email. There’s a couple in Dublin, one in Cork, and one is nationwide. We’re also planning further events around the country in the coming months. More info and register for your free ticket here. We’re teaming up with Financial Justice Ireland to bring you a workshop exploring debt relief from international monetary institutions with Heron Belfon, director of Jubilee Caribbean in Grenada. Issued in news on March 13, 2019 at 17:20:00. Get your FREE ticket to the Dublin event on March 25th here. Get your FREE ticket to the Cork event on March 26th here. 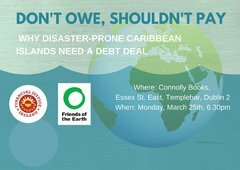 Join Financial Justice Ireland & Friends of the Earth (plus the Galway One World Centre for the Cork event) to discuss how climate chaos is fuelling natural disasters and a debt crisis in poor Caribbean island nations like Grenada. Issued in the blog on March 08, 2019 at 13:41:00. This week, I felt a prickle of tears catch me off guard as I watched 14 and 15 year old climate leaders prepare what they were going to say to Ireland’s top politicians. It was the most inspiring meeting I’ve ever been too, and all I could think was, I hope by the time these young leaders are in power, it’s not too late to fix this. Issued in news on March 07, 2019 at 02:47:00. What is happening on the 15 March? Greta Thunberg, the 16 year-old Swedish climate activist, whose lone weekly climate strike has become a global movement, has called on everyone to join a global climate strike on Friday 15th March. The protests are being led by students striking from school to call for #ClimateActionNow to meet the tempertature goals of the 2015 Paris Agreement . Many others, young and old, intend coming out in solidarity with the children and students. 1pm on Friday 15th March is the central moment in Ireland. Issued in the blog on March 05, 2019 at 18:01:00. 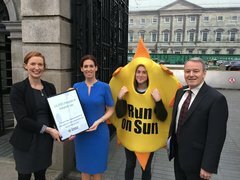 A new law to force electricity companies to pay small renewable energy generators for their power was debated in Leinster House this week. It's hard to believe, it doesnt happen already, but small renewable energy generators in Ireland give their electricity to the grid for free if they can't use it all on site immediately. Kate Ruddock was giving evidence at the Oireachtas Committee meeting along with Paul Kenny from Tipperary Energy Agency, Jim Gannon from SEAI and Michael Manley from the Department of Communications, Climate Action and Environment. or just Kate's speech here. "We met Leo Varadkar at Electric Picnic a few years ago.